There are lots of ways to support us and there are lots of reasons. In the immediate aftermath of Hurricane Katrina many relief organizations rushed to the Gulf Coast to provide search and rescue, medical services, food distribution, tarps and tents. More than 10 years later, Habitat engages many coastal Mississippi families who still struggle with housing conditions that have become a stumbling block on the road to full recovery. Habitat for Humanity of the Mississippi Gulf Coast (HFHMGC) is always looking for local partners to help us fulfill our mission of rebuilding the coast. Our operation only works when volunteers offer their time and financial contributions to help build quality housing that is the most affordable and accessible housing solution for many coast families. Your donation of time, money or just being an advocate helps us meet the demands of workforce housing for thousands of displaced families. With the support of generous donors and volunteers, Habitat for Humanity of the Mississippi Gulf Coast has made great strides in strengthening the Coast’s affordable housing market. There are a variety of giving options that will help us continue to build homes in Harrison, Jackson and Stone Counties. A CGA is a contract with HFHMGC that guarantees fixed payments to one or two annuitants for as long as any annuitants survive; the remaining balance of the CGA is released to HFH Mississippi Gulf Coast. A simple and effective way to change families’ lives while reducing income and estate taxes is to name Habitat as a beneficiary of your pension assets (e.g. IRA, 401(k), 403(b)). Simply request a Change/Add Beneficiary form from the institution that manages your IRA or pension plan. You or your company can donate stock, stock options, and other investments to HFHMGC in one simple transaction. A gift of stock owned for more than one year usually entitles you to a charitable deduction for the full market value at the time the gift is made. You benefit by avoiding capital gains taxes and reducing income taxes. Bequests are the transfers of wealth that occur upon a donor’s death and that include transfers by means of a will or a trust. 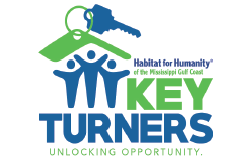 Become a “Key Turner” by joining our Key Turners Program. A recurring giving program is one of the most cost-effective, long-term fundraising methods available. Donors commit to a donation to be paid regularly over a period of time with no specified end. Questions? Ideas? If you have any questions or ideas for individual giving or to discuss options such as Charitable Lead Trusts, Charitable Remainder Trusts, and more, please contact tellmemore@hfhmgc.org or call 228.678.9123. Desired items include but are not limited to nails, hurricane straps, full units of plywood, full units of studs, roofing, etc. It is difficult for us to accept finished products such as doors, windows & cabinets due to building to a uniform finished product. Please contact Mike Durand at 228.234.9183 or mdurand@hfhmgc.org with any questions or inquiries. We have accomplished so much in 2018.